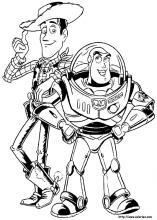 Buzz Lightyear Coloring Pages For Kids. Get Some Fun Ideas For Your Toy Story Party Ideas. "To infinity... and beyond!" "To Infinite and Beyond"...we all remember that phrase from the Toy Story character, Buzz Lightyear. Well, now your kids can color Buzz Lightyear coloring pages to infinite and beyond! We've found the links to a lots of fun coloring sheets. Buzz Lightyear was a toy who didn't realize he was a toy. He was given to Andy as a Christmas present in the first Toy Story movie. At first Buzz is rather annoying to the top toy, Cowboy Woody, because he believes he is the real Buzz Lightyear and he also thinks all his equipment works. Buzz finds out that he is just a toy and Woody helps him come to terms with it. They become fast friends and lead the other toys into many other adventures in Toy Story 2 and 3. "Toy Story 16"" Pinata" Kids and adults alike enjoy the Toy Story movies and the fun cast of animated characters they introduced to us. Find lots of fun coloring pages of this crew right here! Find pictures of Buzz, Woody, Jesse, Bullseye, Hamm, Rex, Slinky, Mr. Potato Head, Space Aliens...go and see all the fun characters you will get to print out and give to your kids.